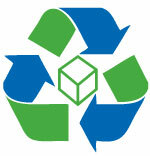 04/02/2013 -- Alpha Rho Inc. is proud to announce its expanding green energy policy. Partnering with E.L Harvey & Sons, Inc., a local waste and recyclable materials company, Alpha Rho adds corrugated cardboard recycling in its effort to support the reduction of the flow of waste material. This is now added to its ongoing recycling of plastic scrap, and machine oil that is generated at their manufacturing plant. This year Alpha Rho Inc. has raised the bar again by setting a new standard in being the environmentally conscious plastic box manufacturer. David Tall, President of Alpha Rho Inc. states that, “Our emphasis is on increasing recycling waste wherever possible, which is essential in making the environment safer and greener”. Corrugated containers are generally one of the highest percentage commodities in a company’s overall waste stream and one of the easiest to recover for recycling. In addition to recycling corrugated cardboard and used machine oil, Alpha Rho Inc. also regrinds their plastic scrap into non-processed material and re-molds it, which allows plastic parts and scraps to be re-utilized. Alpha Rho manufactures a wide assortment of plastic boxes and novelty plastic items. The rigid plastic boxes are suitable for many applications including beads, gifts, jewelry, candies, hardware items, industrial applications, food products and much more. For samples, catalogs and order requirements please visit Alpha Rho. Alpha Rho Inc. was founded in 1965 by Alvan Tall, who had previously spent 18 years working in corporate management for the Foster Grant Company, a major manufacturer of sunglasses and novelty items. Alpha Rho has grown to be one of the largest domestic manufacturers of high quality hard plastic boxes. Early products were made for the medical, computer, aerospace and toy industries, but during the past decade, additional items have been added to the line of plastic boxes and Alpha Rho continues to further expand into the market. Alpha Rho now has a wide range of compartment plastic boxes to suit the hobby, confectionery and hardware industries. Hot stamping and pad printing services have been added that have allowed Alpha Rho to offer customized services to its many customers who represent the cosmetic, mineralogical, scientific, craft, and pharmaceutical industries.